While Nigel Farage and Ukip are undoubtedly fair game for satirists, a musical comedy might seem like a bit of a stretch. Not so for Hell Bent Theatre’s Cath Day, which has crafted a bitingly funny, thankfully fictitious story that pokes gleeful fun at the party’s leader and his remarkable rise to power. Original songs in variety of cohesive musical styles feed the narrative but, like all good satirists, Day never loses sight of the underlying menace of her subject. The composer’s wicked sense of humour is evidenced throughout a score bursting with remarkably catchy tunes from the craftily titled Bongo Bongo Land to the Ukip immigration anthem Let’s Pull Up the Drawbridge. 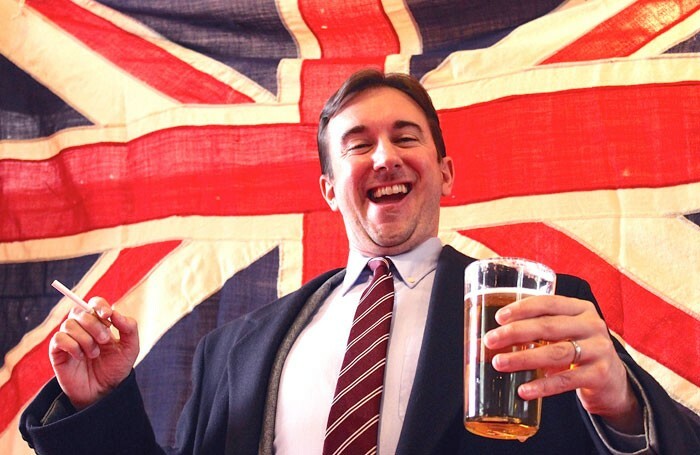 Darren Benedict is a riot of mannerisms and fake nostalgia as Farage, moulded into the gurning figure we know today by a cabaret version of Godfrey Bloom. In the interest of fair play, several other MPs are mercilessly lampooned, including James Viller’s ineffective, adenoidal Ed Miliband and Chloe Ward as a desperately gung-ho Boris Johnson. Jessica Williams’ lively and inventive direction is the icing on the cake, complementing Day’s comic style – Hell Bent will be a name to keep an eye out for on the musical stage.